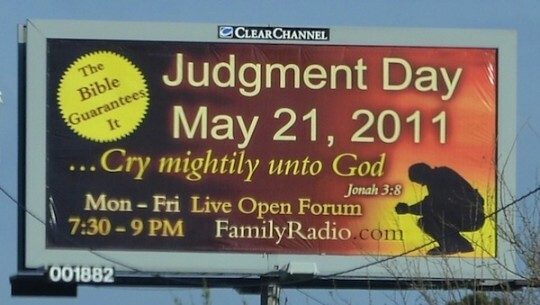 I stole this image from a fundamentalist website, thus guaranteeing I’ll still be here come Sunday. If you have absolutely no idea what I’m on about, congratulations: you would appear to live a life completely free of religious cult doomsday nonsense. If you’d like to sully yourself, NPR has a well-written and pithy article on the whole mess available right here. This entire kettle has been stirred courtesy of Family Radio, a fundamentalist Christian network headed by Harold Camping. Camping is no stranger to the end of the world; in fact, he first predicted the rapture for September, 1994. Obviously needing to backpedal, he now claims that he hadn’t yet adequately completed his study of the Bible at the time. A decade and a half or so of solemn research (and time for the majority of the population to conveniently forget his botched first prediction) passes, et voila: no more Ned Flanders types to bail us heathens out after Saturday, fellow sinners! Generally, I like the idea of people like Camping operating in public: better to be an easily identifiable whack-a-loon than a wallflower holed up in a gun tower, waiting for who knows what to set him off. I just wish there were some simple way to hold them accountable for their irresponsible messages. Perhaps the Martinez family will sue when all is said and done. Lord knows they’ll have a case. Rapture Redux? More like Re-didn't! Keep them Cards and Letters Coming!